With the recent release of Hiero 1.9v1, I was thinking of not posting this problem on my site thinking it fixes the muted audio playback that I encountered in my project (which teaches me a big lesson in doing more prototyping in a new software). What’s up with the muted audio in Hiero issue? My audio playback fine! So the problem here is that prior to Hiero 1.9v1, there is two frame rate playback that will result in muted audio during playback on any sequence. The problematic frame rate is 29.97 and 59.94. While I don’t have the luxury to try out Hiero on OSX and Linux to verify if the problem persists throughout different OS environment, the problem occur on my current workstation setup which is running on Windows 7 SP1 64-bit. Any workaround to quench the thirsty throat of Hiero? Good news, Hiero 1.9v1 finally fix the muted audio at 29.97 FPS although 59.94 still remain muted from my testing. Bad news, there is no proper workaround other than working at the nearest rounded FPS which is 30FPS and 60FPS (for those who need to remain in older Hiero due to ongoing production). The problem with rounding up from 29.97 to 30 FPS is the slight speed up (29.97 is 999/1000 * 30). So by converting the sequence playback in Hiero from 29.97 to 30 FPS resulted in approximate 0.001% speed up. So a lengthy sequence will have noticeable impact from doing this conversion just to ensure proper audio playback. *Before I proceed, the Octane Render I’m using when the problem occur is Octane Render 2 and not the prior version. OK so this problem is pretty much isolated to me only as I can’t get to search for the problem message on Google and Bing. 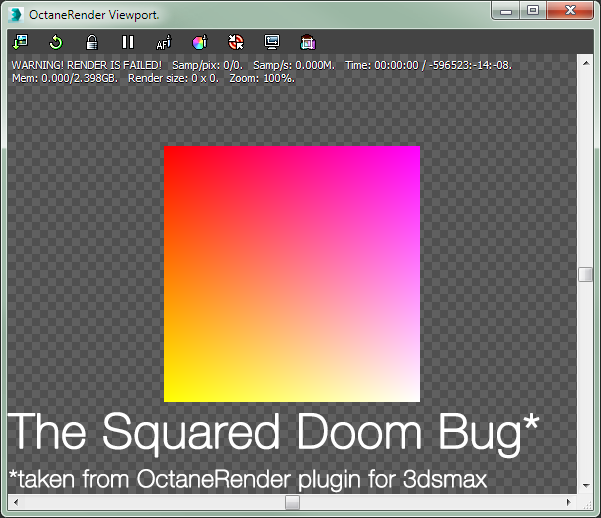 After much troubleshooting, I managed to find a temporary workaround to it and fret not, your plugin still works fine so don’t go uninstall Octane Render and 3dsmax only to try reinstall it with the same error message! As shown in the screenshot at the top of the post, I got this message after opening a MAX file where I’m using Octane Render to prototype lighting mood for a project I’m currently working on. After much dismay that even tinkering with all sort of settings and deleting all Octane Light in the scene, the problem still persists. Reinstall Octane Render and the plugin with latest version from OTOY site: FYI, the Octane Render standalone works fine but the plugin still give the same error message. Install the latest SP for 3dsmax 2014: Same error message regardless of any scene. I’m using the educational version which I believe is no different than the commercial version except for the 3 year valid period. Install 3dsmax 2015 with SP2: HEY IT WORKS…! Only for blank scene though. My current project scene still give the same error message. At least I know the plugin is working fine after installing 3dsmax 2015 which prompts me to narrow down the culprit to my project scene. Just in case, I’m using the latest stable driver by Nvidia which is 340.52. My system specs can be found here for those who are interested. Turns out there is two possibility to fix the issue at RANDOM times. When opening the problematic scene file, make sure to put all Octane Lights in one layer and hide it before opening Octane Render viewport or rendering with it. Look for any objects that uses Octane Material and hide them before using Octane Render viewport/rendering. When you either or both steps above, Octane Render viewport should works fine and here’s the magic moment, when you unhide Octane Light/Material object (provided you enable moveable proxy in their settings) it will appear in Octane Render viewport perfectly! If you never configure moveable proxy, just reload Octane Render viewport and it should works fine. I believe when there is many Octane Light in a scene (which I currently have at 12 lights including the HDR map), Octane Render viewport goes bonker when you open it for the first time after a scene is loaded. Still hard for me to say as when you keep adding more lights into a fresh blank scene, Octane Render happily gobbles up all the light (save for a much much slower rendering time). Since I don’t have the luxury of free time to pinpoint the exact cause, I’ll say the known workaround that I listed above works everytime. After my current project is done, I’ll be posting this issue at OTOY forum as I did try to contact them through Twitter but it goes unanswered for now. As there is numerous error/bug that I’ve encounter when working on a daily basis, it is second nature for me to look up online to see if there is a solution to it. Sadly there are times where with lots of different keywords search and reading through lot of forum posts, there is no solution to it. WORST there is no such bug reported at all! This is where Bug of the Day will be my own little side project to document nasty bug that affect my workflow so others can be made aware of it and a workaround if I managed to find one. For now, there is two bugs with each from Hiero and Octane Render plugin for 3ds max which annoys me to no end as I can’t find a solution to it online despite numerous attempt to reach the developer (with a less than stellar response from the support team at The Foundry which leads me to create this feature). What prompts you to create this feature? Although the initial feedback from The Foundry support team is a rare isolated case, I believe if one write a detailed report of a potential bug report then do not reply back saying having an educational licence (more appropriately the Graduate Licence) is not eligible for having access to the tech support. While they are nice to ask me if I need help me activate my account at their forum (which requires moderator approval), it still in limbo state. So telling me to ask about the bug problem at the forum is a no go for me hence the email approach. What baffles me is all my prior emails to The Foundry support team was reply in a promptly manner with proper feedback. So as said before, this isolated case leads me to create this feature as a mean for me to document software bugs with a known workaround.